Cookie dough ice cream is my favorite ice cream flavor. As a kid, I would always save the cookie dough until the end and enjoy it in one big glob of cookie dough! For this cookie dough milkshake, I used vanilla ice cream, milk and made my own eggless cookie dough to blend in. For all of you cookie dough lovers, this milkshake tastes like heaven. After it is blended up, the cookie dough is no longer chunky since it is dispersed among the milkshake as small bits. Top this milkshake with larger chunks of cookie dough to make it even better! 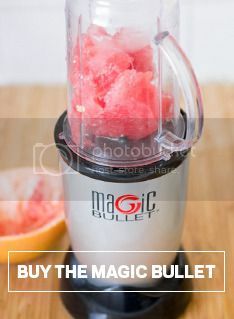 Add all ingredients to a Magic Bullet cup and pulse a few times until the cookie dough is evenly dispersed (you may want to save some of the cookie dough in larger chunks for topping). Top with whipped cream and extra chunks of cookie dough. This mango apple banana smoothie is one of my favorite breakfast smoothies. It is so simple, with only 4 ingredients: mango, apple, banana and water. No extra sweetener is needed, since all three fruits have plenty of natural sugar. The water gets things moving, while the frozen mango chunks and banana adds a nice, thick and creamy consistency.